The Greenwich Wine + Food Festival presented by PepsiCo today announced the final schedule and list of participants for both its Opening Night Master Chef Wine Dinner and Culinary Village events, benefitting the Multiple Myeloma Research Foundation, the Town of Greenwich Parks & Recreation Foundation and Ment’or. Check it out! The Opening Night Master Chef Wine Dinner, held at Roger Sherman Baldwin Park on Friday, September 21, will honor Alex Guarnaschelli for her innovation and substantial contributions to the culinary world, as well as the 2018 Most Innovative Chefs (Susanne Berne, Bianco Rosso, Wilton, CT; Ben Freemole, The Tavern at Graybarns, Norwalk, CT; Julio Genao, Prime Stamford, Stamford, CT; Cedric Lamouille, Bistro V, Greenwich, CT; Jay LeBlanc, Knot Norm’s Catering Co., Norwalk, CT; Ben Pope, Mr. Koo’s Kitchen, Irvington, NY; Armando Sanchez, Washington Prime, Norwalk, CT; Antonio Selendic, Dubrovnik, New Rochelle, NY; and Brad Stewart, Flinders Lane, Stamford, CT). Gary Dell’Abate and Rob Burnett will co-host the evening, with Scott Conant and Adam Richman in attendance as special guests. 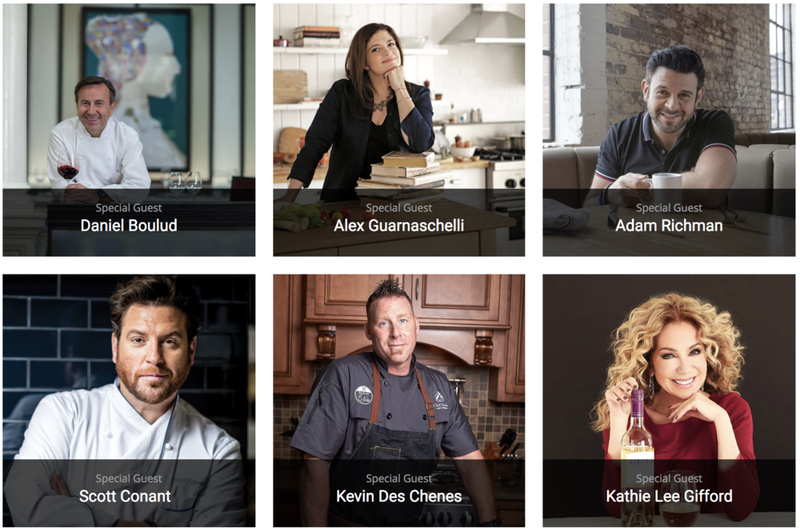 The Innovative Chefs, as well as Festival Ambassador Chefs (Mogan Anthony, Village Social, Mount Kisco, NY and Locali, New Canaan, CT; Rui Correia, Douro, Greenwich, CT; Lisa and Steve Maronian, Sweet Lisa’s Exquisite Cakes, Cos Cob, CT; Nick Martschenko, South End and SE Uncorked, New Canaan, CT; Debra Ponzek, Aux Delices, Darien, Greenwich and Westport, CT; Robin Selden, Marcia Selden Catering, Stamford, CT; Matt Storch, Nomeez, Bridgeport, CT, Match, Norwalk, CT and Match Burger Lobster, Westport, CT; Luke Venner, Elm, New Canaan, CT; and Ian Vest, Back 40 Kitchen, Greenwich, CT) will serve their gourmet cuisine alongside curated wines and artfully-crafted cocktails. The evening will end with a musical performance by CCB Reggae All Stars. 12:30-5:00pm – The Celebrity Green Room, presented by Ethan Allen, will host celebrities and culinary experts in a luxury lounge while being interviewed by Serendipity contributing editors Chef Matt Storch and Chef Robin Selden.